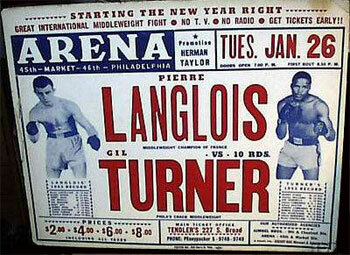 Gil Turner won a ten round decision against Pierre Langlois at the Philadelphia Arena on this day in 1954. The win raised Turner's record to 43-4 (30 KOs), as he continued his dalliance with the middleweight division. Fighting a good ten pounds heavier than his natural weight, Turner was still trying to shake off the effects of his 1952 KO loss to welterweight champion Kid Gavilan. Some say he was never the same after that bout, but the crowd-pleasing workman from North Philly fought on for many years in both the 160 & 147 pound classes. He had many more high-profile fights, but never again did he contest for the title.